Chris Wilder, never a manager to try and blind people with science, admitted the outcome of this match had boiled down to “who booted the ball best”. Oldham Athletic, on a playing surface better suited to building sandcastles than professional sport, lumped it forward with more venom before the interval. Sheffield United discovered their kicking boots after the break. Which is why, after an hour and a half of industrious but low-quality action, the fixture finished all square. O’Shea’s second-half goal, which preserved the Blades’ 10-point advantage over third place, ensured Wilder’s side did exactly that. Against opponents also hampered by the conditions, they fell behind when Tope Obadeyi exploited a defensive error to score only his fourth and Oldham’s 27th’s goal of the campaign. Despite the club’s size and stature, huge swathes of the League One leaders’ squad played at non-league or semi-pro level before arriving in South Yorkshire; something that, O’Shea insisted, has equipped them with the wherewithal to simply get on with things when the going gets tough. “Maybe that’s given us the ability to get results on pitches like this,” he continued. “Maybe that has given us an edge, because a lot of the lads have experience of playing in conditions like this. The likes of Alan Woodward and Eric Gemmell would have scoffed at the notion that skill is the first victim of a less than pristine pitch. Indeed, even Wilder and Oldham boss John Sheridan, are likely to have encountered much worse during their own playing careers. 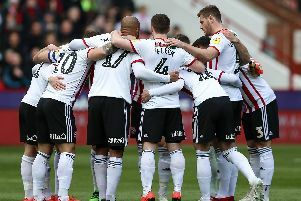 Nevertheless, both adjusted their tactics and team selections to suit, with Wilder later admitting he had rested Mark Duffy as a precautionary measure and even contemplated benching his most prolific centre-forward, Billy Sharp. In the event, the visitors’ captain and leading marksman did take part only to produce arguably his most ineffective performance in recent months. Wilder, who worked under Dave Bassett during the first of his two spells as a player at Bramall Lane, explained why United had adjusted their approach. “Players today just are not used to pitches like that,” he said. “They come through academies and play on training grounds that are immaculate. In my career, playing on pitches like this came natural. “Someone was having a right pop at me from behind the dugout, saying we were a long-ball team. Paradoxically, both Obadeyi and O’Shea’s efforts were well-crafted strikes. Paul Green, one of the few players who seemed comfortable with the conditions, threaded a delightful pass inside Matt Done and into his colleague Josh Law’s path. Obadeyi, spotting the possibilities after Ethan Ebanks-Landell had earlier been caught in possession, continued his run before turning home the defender’s cross from close-range. United were quickly back on level terms when O’Shea, combining well with James Hanson, swept home from 20 yards out for his second goal since leaving Chesterfield on loan. Sharp twice went close and both but United could not make their late pressure tell.